Meiji Era naturalist and polymath Minakata Kumagusu (1867-1941) described his chosen home of Tanabe as a quiet place with kind people, cheap commodities and beautiful weather and scenery — a description that still holds true. On the 150th anniversary of Minakata’s birth, I traveled to Wakayama Prefecture to explore the Kii Peninsula and photograph the area that gave birth to one of Japan’s greatest minds. I began at Kumano Nachi Taisha Shrine. Minakata took residence near the shrine between 1901 and 1904, collecting specimens in the dense forests that surrounds it. He refined some of his most complex philosophical and scientific ideas during his time there, attempting to combine Buddhist doctrines and Western empiricism. At the shrine, an autumn festival called Momiji Matsuri was being held in honor of the long deceased Emperor Kazan. In the year 986, Kazan wrote poems about autumn leaves on strips of fine paper. He tied them to twigs and let them float downstream from the Nachi Falls. It started to rain just before the ceremony was about to begin. 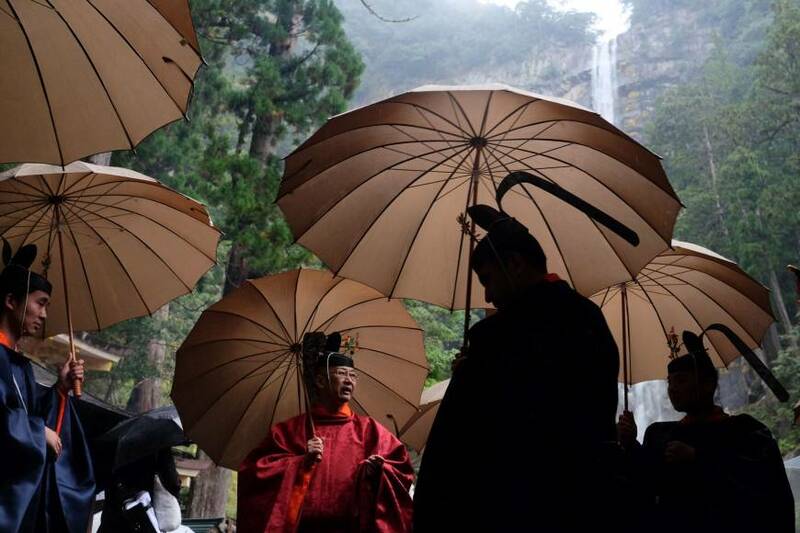 Ideally, mist from the Nachi Falls would be the only water to touch the robes of the priests as they made offerings, but the gods clearly had other plans. The ceremony was moved into a modular room near the waterfall and VIPs in blue rain jackets were ushered in and seated together on fold-out chairs. Local camera crews crowded the half-opened sliding doors as the kannushi priest recited prayers in the direction of the 133-meter-high cataract. 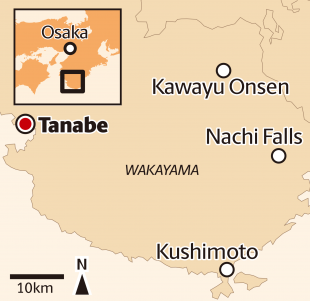 I wondered how rain would have been handled in Minakata’s — or even Kazan’s — time. Would they have sheltered somewhere dry or continued the ceremony in the elements? Is it the continuity or the pageantry that must be maintained? Inside the room, prayers finished and offerings were made, young priestesses completed their dance and the priest exited the room into the light rain. Umbrellas all around. 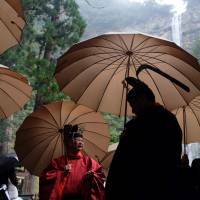 The procession curved down the moss-covered stone path to the foot of the Nachi Falls. There, poems written on colorful slips of paper were thrown into the punch bowl and scooped up in nets before they could flow downstream, a modern environmental gesture Minakata himself may have appreciated. That night I took a room at Akizuno Garten, a Meiji Era schoolhouse converted into a restaurant and bed-and-breakfast run collectively by locals and farmers. The next morning I was taken to see a nearby citrus orchard where the restaurant sourced its fruit. I waited at the bottom of the terraced mountainside as the sound of a diesel engine grew closer. 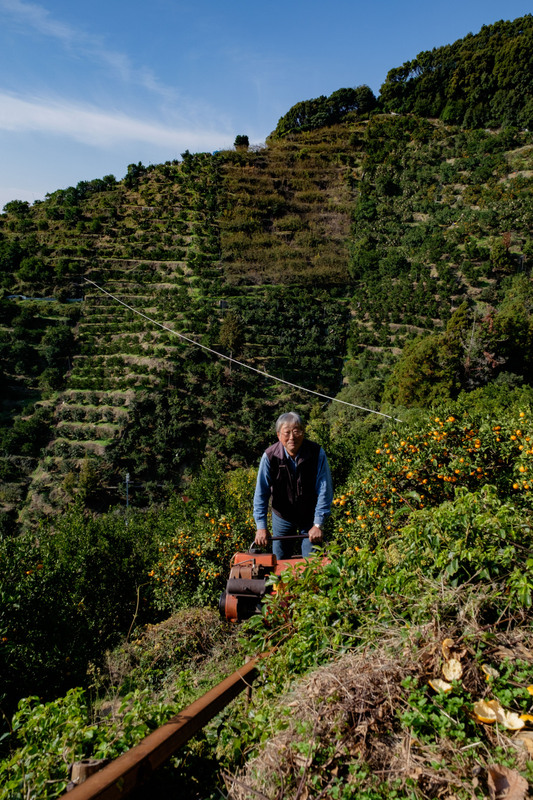 Out of the citrus groves came 64-year-old owner Moriyama Shigehiro riding side-saddle on a flatbed monorail made for bushels of fruit: mikan, yokan and oranges. I laughed as he dismounted, realizing we would be taking the same contraption back up to the top. We chose our positions, me in the back leaning against a metal bar to better photograph the ascent — or potential calamity. On the makeshift funicular, we trundled back through the orchards along a single steel rail to the top. There we stood and gazed at the panorama of the valley below. 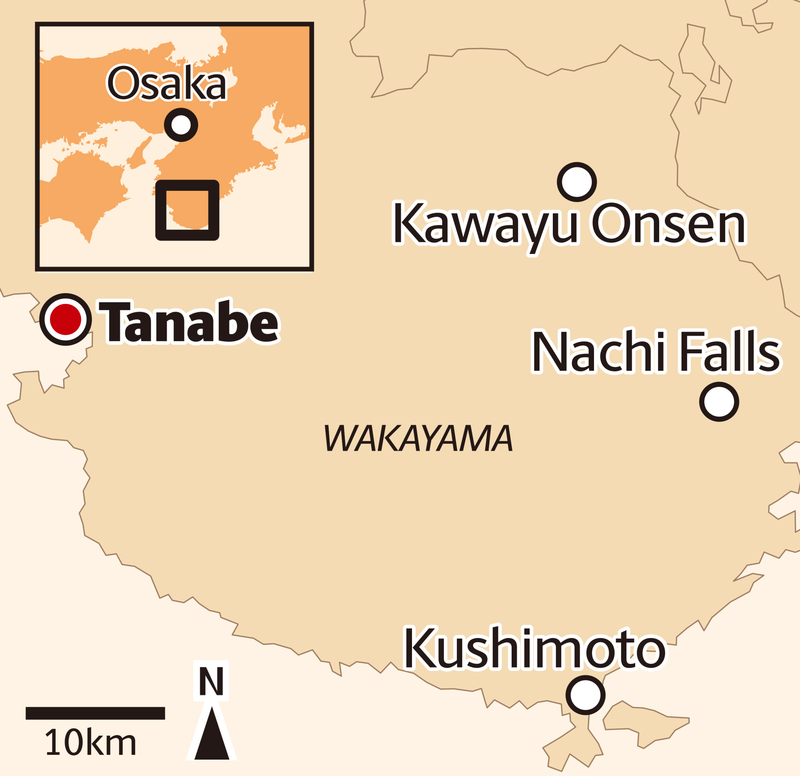 The elevation gave a sense of scale to Tanabe, a city that includes some 1,200 square kilometers of mountain forests, citrus, plum and persimmon orchards, and cobalt rivers that meander down to the sea. The region spread out below as a diorama, its features miniaturized by distance. I imagined Minakata taking in similar views over a century before, standing in awe of the beauty of the natural world and pondering humanity’s place within it. In the basement of the Minakata Kumagusu Museum, I pored over handwritten documents preserved behind glass. His handwriting was minuscule and precise, written in both Japanese and English in notebooks and on scrolls of aged paper, each character a concentration of his wide-ranging intellect. I was reminded of the notebooks kept by Aleksandr Solzhenitsyn during his time in the Soviet gulags, written impossibly small to conserve paper for the years of captivity ahead. 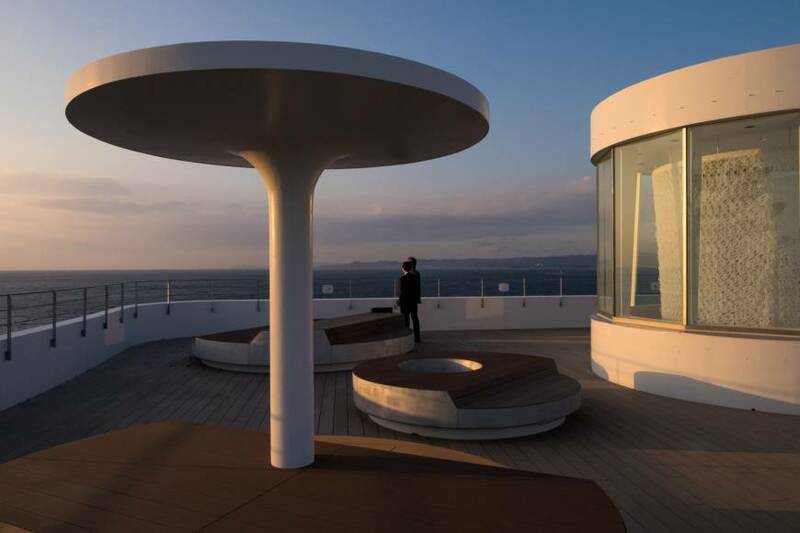 The rooftop of the museum provided windswept views of the bays of Shirahama — rock formations jutting up from the sea floor — and of the forested Kii mountains where Minakata cataloged molds and lichens before setting out into the world. One of the first places he traveled to was my home state of Michigan, where he studied at the Michigan State School of Agriculture — the same university as I had — before he moved on to Florida, Cuba and then London, England. Years later, Minakata would return to Wakayama a cosmopolitan, but without a degree to show for his education. Now a museum has been built in his honor. From Tanabe, I took the Kinokuni Line along the coast to the town of Kushimoto. 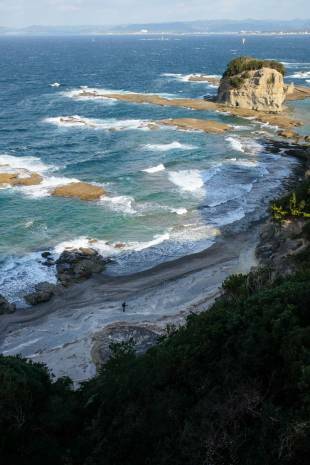 Near the Hashigui-iwa rock formation, bus loads of junior high school students were avoiding having their class photos taken, skipping stones into the sea as teachers tried to rein them in. Despite his reputation as an academic, Minakata struggled in school settings from an early age, preferring to remain outside the classroom observing insects and plant life. Many of these students, especially the boys, appeared to suffer from the same affliction. If there were a savant among them, he too might be an unruly kid with a lack of focus in the classroom. A Minakata-run school would almost certainly have been held outdoors, perhaps in a place such as this, students wading in the tide pools, learning about the biological universe living in the shallows. Abandoning the coast, I caught a bus into the mountains along the Kumano River. Steep roads curved around the poured concrete grids that cover so many of the mountainsides in Japan, a Brutalist solution that may actually increase flooding. How often were the roads washed out before they were built? How frequently our solutions create a problem for every one they solve. At Kawayu Onsen, I opened the window in my room and took a moment to watch dusk turn to night. The sun retreated behind the peaks, filling the valley with golden light that shimmered on the surface of the Oto River. Two bathers, egged on by their party, left the man-made baths to jump into the river before dashing back to the warmth carrying their small white towels in front of them. After dark, I headed down to the riverside to bathe. Lying back on the rocky edge of the riverside hot spring, the sky was a tessellation of stars and darkness. I wondered if this was how the natural world appeared to an intricate mind such as Minakata — as a brilliant tapestry of natural phenomena made real through human observation.